In a post a few days back here on Urbanism Next we talked about how the trucking industry unions were expressing concerns about AV trucking for safety and other reasons. It is pretty clear there will be substantial job losses in the trucking industry. The Bureau of Labor Statistics estimates there are more than 1.7 million employed in the trucking industry—though this is very broadly defined. There were about another 1.5 million employed in peripheral jobs in the industry in 2016. These jobs, as indicated in the table, pay well on average for people without a 4-year degree. The elimination of these jobs will have substantial equity concerns over the long-run. 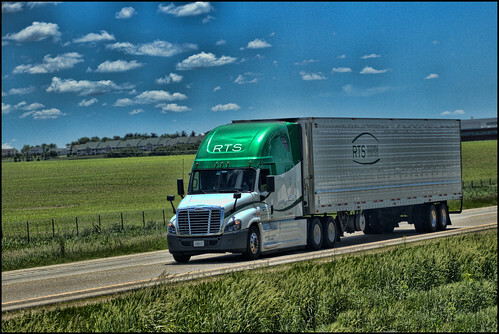 The BLS has estimated that the trucking industry will grow by about 4.7% between 2014-2024. This growth will be tempered by AVs, which are not yet on the market. The impact on wage growth in trucking will be substantial and the overall growth of this sector as a place to attain a job. However, when we start to think about how AV trucking will impact job or wage growth we have to think about not just the people behind the wheel, but also all of the people that support those individuals as they drive across the country. A recent article on the ‘Machines with Brains’ blog points the struggles that many non-trucking, but trucking dependent industries, will face in the near future. They provide examples of when new highways are built, diverting traffic from once busy thoroughfares to new routes. When the trucks stopped rolling through some sleeping towns in rural America, the revenue and customers disappeared as well. Now, imagine what will happen with that Peterbuilt truck rolling across Iowa no longer needs to stop for food or coffee? As the Quartz article points out: “The machines won’t get tired and they won’t need to eat breakfast, meaning the towns and truck stops built to serve the needs of humans drivers could one day be irrelevant.” They point out that truck stops employ 2.2 million people nationwide. Even if the AV truck transition is slow, there are a lot, I mean a lot, of jobs at stake. If that trend continues, there will be 8,600 store closings this year – much more than closed during the 2008 recession. 10 Large retailers have filed for bankruptcy as of mid April 2017. This compares with 9 total large retailers in ALL of 2016. Last year, E-Commerce sales increased from 10.5% to 15.5% of all retail. Retail is experiencing a large transformation – and this will have a strong impact on brick-and-mortar stores – forcing many to close. This will result in loss of property tax revenue, sales tax revenue, and will force communities to deal with abandoned buildings that bring down values and often increase crime. A new article from Business Insider looks at the continuing decline of indoor malls around the country. 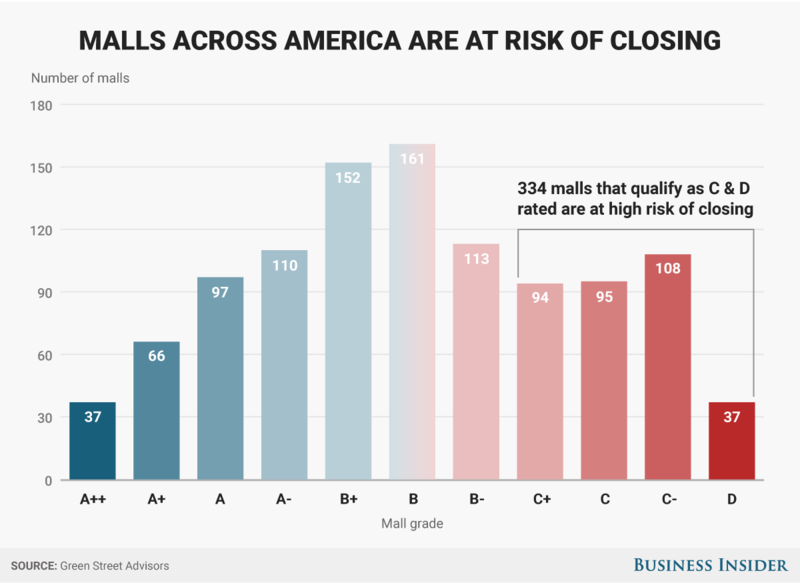 Of the 1,300 malls in the US, a staggering 310 are ‘in high risk of closing’. The largest culprit is the loss of anchor tenants like Macy’s, JC Penny, and Sears – all of which have been seeing large numbers of store closings in part due to the rise of e-commerce (see earlier post about this). The article discusses the range of consequences of these closings including a rise in crime, increasing blight in the surrounding area, and the loss of municipal revenue coupled with a rise in costs for needed fire and police services. Dead malls – and the e-commerce that is contributing to their demise – have large repercussions for cities. As e-commerce expands and potentially reduces the number of strip malls as well (in addition to enclosed malls), these repercussions will amplify. A recent conversation with the planning director of a suburb city focused around the devastating effects the reduction of strip malls and commercial activity in his city would have on municipal revenues. This was especially difficult as he saw limited abilities, compared to more urban locations, for suburban cities to redefine themselves and create vitality, draws, and their associated revenues. In a recent interview, Ford CEO Mark Fields talks about the company’s expansion into various modes and shifting the focus from cars to people. Fields talks about several aspects relevant to Urbanism Next including commercial vitality in cities and accommodating multiple modes while focusing on people rather than vehicles. JC Penny brick-and-mortar sales dropped by nearly 1% while its online sales grew by double digits. Probably the most striking number for the subject of this blog, brick-and-mortar shopping traffic (as in the number of times people went into stores) declined by 12%. That number – if it continues – will inevitably lead to a drop in the amount of brick-and-mortar stores and major shifts in land use and transportation demand. This will potentially also decrease the vitality and activity around commercial areas. Part of the promise of new technological opportunities within transportation is the opportunity to use space more efficiently. Connected and autonomous vehicles can travel closer together, ride-sharing can fill a portion of the staggering amount of empty vehicle seats on our streets and thus reduce some vehicles, and ride-hailing transportation may make it possible to reduce overall car ownership and the need for so much parking, freeing up space on streets and in our communities. Yet, one of the most efficient inventions humanity has ever created also happens to be a space-saving form of mobility – the bicycle. Cities of all shapes and sizes all over the world are “re-discovering” how space, efficiency, distance, economy, health, and sustainability can be addressed through investing in bicycle transportation. Along those lines, London just announced a massive investment in bicycle transportation, seeking to make it a rational option for both short and commute-distance trips. Our challenge now, is figuring out how to right-size each form of transportation, from walking to biking to carsharing to transit to AVs, throughout our cities and communities to maximize not only our ability to reach our desired destinations quickly, but also to maximize the efficient use of limited space, as well as addressing issues of equity, health, and the environment.